San Diego based people and pet Psychic Reader and Energy Healer sets out to bridge the gap between animals and humans for a brighter world. I am excited to announce the launch of my new website http://www.wildtame.com/. I also have an additional webpage at http://www.apetpsychic.com/. Just a reminder that I am also on Myspace if you'd like to be Myspace friends. www.myspace.com/wildandtame. Point Loma Pet Pantry - a lovely, welcoming healthy pet store located in the Point Loma area of San Diego has invited me to give a presentation. I, of course accepted the invitation! It is a FREE event, but since space is limited, pre-registration is required to attend Wild and Tame Talk 101 - The Basics of Animal Communication. Below is the press release for the event. Hope you can join me! Don't forget to R.S.V.P. by January 27! Wild and Tame Talk 101 - The Basics of Animal Communication will be presented by Sindi Somers of Wild and Tame Wellness and Communications at the Point Loma Pet Pantry located at 3704 Voltaire St. in the Point Loma area of San Diego. This free one hour seminar will be held Thursday, January 29 at 7:00 PM, followed by a Q & A session. Space is limited. Pre-registration is required by January 27. To reserve your spot, call Point Loma Pet Pantry at 619-222-1986 or email plpetpantry@att.net. In this introductory workshop, Sindi will share her approach to animal communication. You have the ability to communicate telepathically. You are already doing it; you just might not know it yet! Discover how to be more fully present so you can be consciously aware of the messages you are sending and receiving. Learn tools to help you be more in charge of this fun and powerful communication process. Gain confidence in your natural ability to communicate non-verbally, even with those that are not physically present! 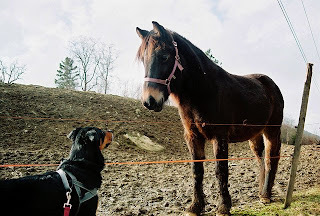 The techniques taught can enhance your relationship with any animal or person. A parent or legal guardian must accompany those under 18 years of age. Wild and Tame Talk 101 is for people only. With the exception of certified service animals, please leave your pets at home. In addition to being an animal lover, Sindi Somers is an Animal Communicator, Psychic Reader, Energy Healer, Meditation Teacher, Dog Walker, Pet Sitter and Writer. She has always had an awareness of the spiritual realm. A graduate of and former teacher at the CDM Psychic Institute in Washington State, Sindi relocated to San Diego and merged her experience with her affinity for animals and Wild and Tame Wellness and Communications was born. Visit http://www.wildtame.com/ for more information. Native San Diego resident, Samantha Sarsilmaz has always had a passion for pet nutrition. After having a pet sitting service for 10 years, Samantha purchased Point Loma Pet Pantry in April of 2008. This has provided her with the opportunity to share her passion and acquired knowledge with a larger audience. She says, “I get to help people each and every day with their pets and nothing in the world could be more satisfying!” This healthy pet store’s goal and mission is to educate and inspire every customer about the positive effects of proper nutrition and supplementation for their animal companion. Seeing the health benefits of feeding raw diets, they are huge advocates, supplying nine freezers with a wide variety of raw pet food, as well as a great selection of dry kibble, canned food, dehydrated and freeze dried dog and cat food, treats, supplements, toys, natural flea treatments, humane collars and other supplies. They are open seven days a week; Monday – Friday 10 am – 7 pm, Saturday 10 am – 6 pm, Sunday 10 am – 5 pm. Visit http://www.pointlomapetpantry.com/ for more information.